For the modern bohemian, the wanderer, the optimist, the creative, the bon vivant. An unconventional, carefree approach to the stylish life of the semi-nomadic, layering a blush, white, cream and dove grey colour palette, inspired by the ethereal style of Stevie Nicks. Wild Heart Living Room Pack contains: limited edition 'Morocco' print by Georgina Skinner (oak framed and exclusive to Nathan + Jac), seadrift solid blackbutt timber stool in white, timber & glass tea light candle holder, ceramic geometric vase set, S collection scented soy candle (Gardenia), rose quartz, 'Chloe - Attitudes' coffee table book by Sarah Mower, marble tray, large sheepskin, 'Dolly' & 'Leah' 50 x 50cm cushions by Nathan + Jac. girl's bedroom- painting color is Victoriana from Benjamin Moore how to use it:Mix with white. 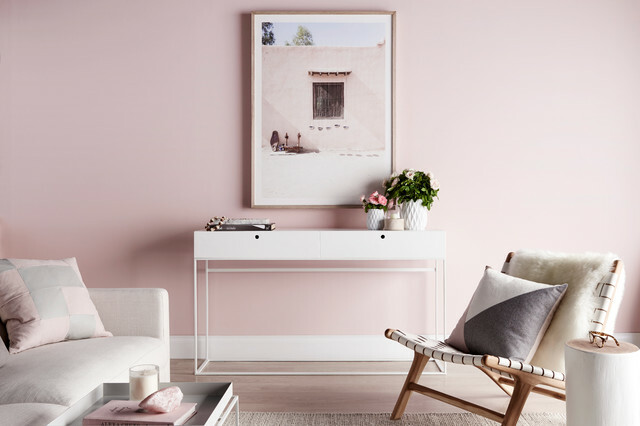 As mentioned, Millennial Pink works wonderfully with lots of white to set it off. However, while white will help the pink look pinker, it also helps break it up, so the overall room doesn’t feel as intense.